It’s not a shortage! It’s not a human capital issue! It’s a mass EXODUS! Change the narrative. 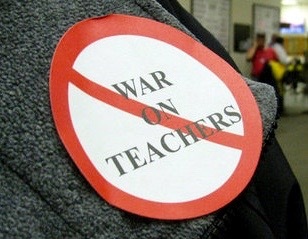 30 years of war against teachers and the casualties are now insurmountable. THAT IS NOT A SHORTAGE! It’s a warning that public schools are close to being privatized and our most vulnerable children will be thrown to a market that doesn’t give a $#@! about them. GET REAL! It’s a WAR and we’re losing. Let’s Change Teacher Licensure to Address the Teacher Shortage: FAILURE!